We Can Remove Hard Water Stains! No matter where you live, removing these stubborn hard water stains on bathroom surfaces such as shower doors and sinks seem to be practically impossible. Hard water stains are ugly and they are extremely difficult to remove. Water often contains minerals such as magnesium, calcium, metal cations, and other compounds such as sulfates and bicarbonates. Soap products that are not rinsed fully can cause problems too. When water containing minerals contacts glass and other bathroom and kitchen fixtures, it can cause water spots to form, spots that are unsightly and hard to get rid of. These spots can even cause severe damage to your glass products and fixtures if you don’t clean these as quickly. Glass and glass products are porous, and the resulting corrosion from the minerals in the water will build up over time, resulting in the need for a professional hard water specialist to restore your glass and other fixtures. Or, you’ll need to replace the damaged items which can get very expensive. Give Glass Magic Colorado a call today and we will help to get your hard water stained glass looking great again! Call Glass Magic Colorado first! 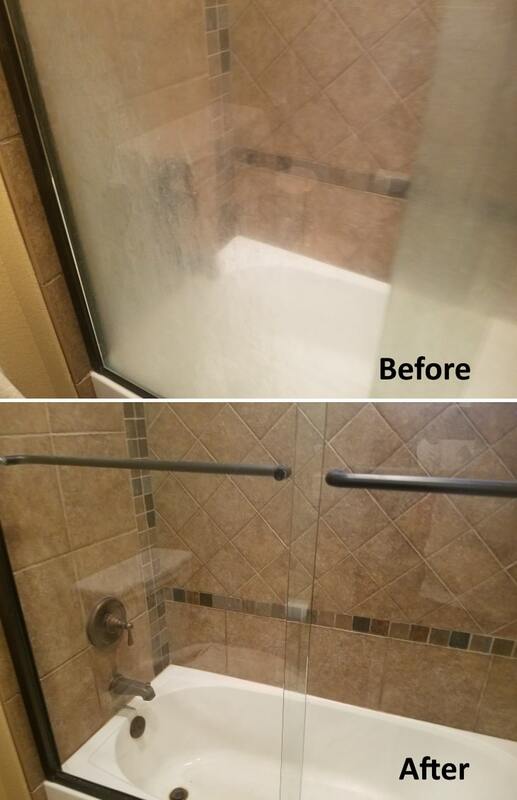 It’s possible to save you thousands of dollars by removing hard water stains from expensive glass, tile and fixtures.